Crisp, pure, and clean, a white-on-white palette can have an extremely power­ful effect on the mind, clearing visual and mental clutter and paving the way to total relaxation. From tile to fixtures to vanities and accessories, a room drenched in white is calm and peaceful, whether it’s steeped in tradition or sleekly modern. 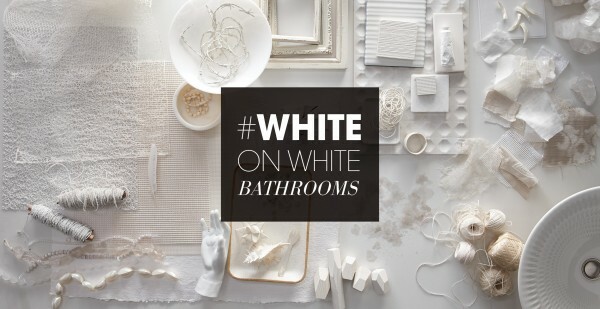 No matter the size of your bathroom, white palettes invite in light for a blissful, spa-like atmosphere. 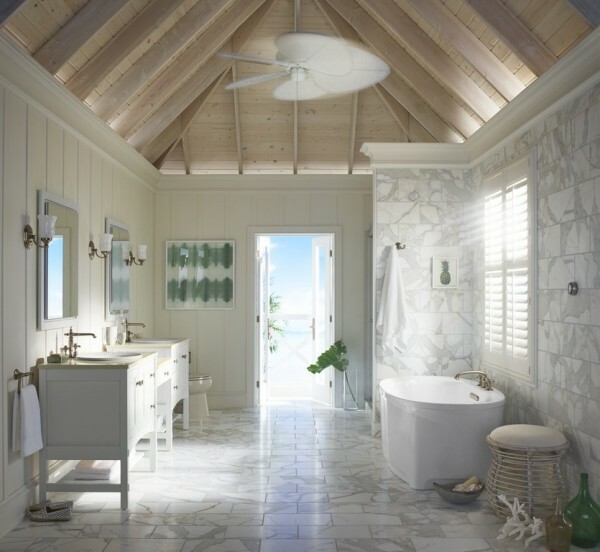 This relaxing beach-house retreat blends a palette’s worth of white shades for a casual, tropical vibe that’s just right for relaxing. A marble floor feels cool on sun-warmed toes, and extends up the wall for a clean look with visual texture. Add spa-like luxury with a freestanding tub and programmable, personalized shower, and you can skip the day spa in favor of your own perfectly private space. Bronze faucets add warmth and softness to the vanity and crown molding’s strong Craftsman-style details. A room with several shades of white captures and reflects light in a unique way. Bright and refreshing in daylight, it glows with warmth at dusk. Rinse off the sand under a rainhead, body sprays or a handshower, all controlled by a shower system you can program exactly to your liking. Love this look? Explore our Sun Bleached Bathroom moodboard. 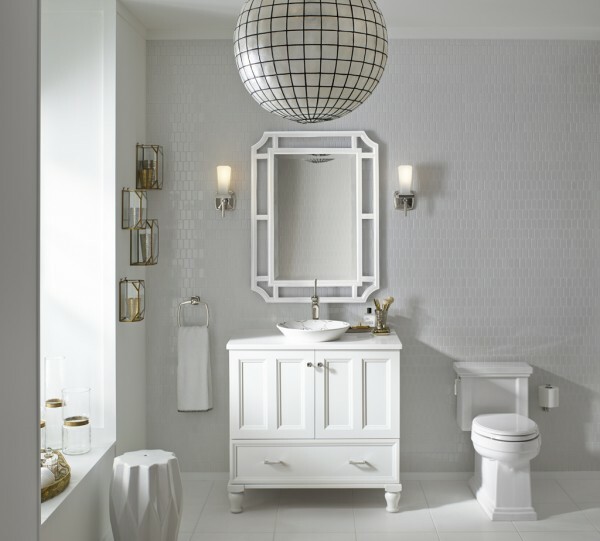 Adding gleaming metallic accents to an all-white bath is a great way to infuse glamour and sparkle. As with fashion, an easy way to get the look is with accessories—in this case mixing the silvery faucet and light sconces with glints of gold in the glass cages, all against a brilliant white backdrop. A boldly framed mirror and an intricately patterned sink inspired by Moorish style create a focal point that ties the elements of the room together beautifully. Blend a variety of materials to keep an all-white room from looking sterile. Sleek and shiny white tiles look softer next to a painted wood vanity. For a subtle yet striking decorative touch that’s far from fussy, opt for a vessel-style sink with a decorative design that integrates metallic details. Add extra interest with low-key Asian influences that don’t compete with the patterned sink, like a bamboo-style mirror and shoji-screen lighting. Love this look? Explore our Persian Gold Bathroom Moodboard. In floor plans with ample space and budget, we’re seeing an increase in the overall size of a shower plus a separate bath for long soaks. Big showers don’t skimp on water experiences, including rainheads, showerheads, body sprays and steam to deliver a pampering spa experience. In a sleek, contemporary white bathroom, this already large shower looks even more expansive and open. Use mirrors that span the width of the walls to maximize an all-white room’s spacious feel. A wall-hung vanity, with no legs or toe kicks to disrupt the floor-to-wall space, creates the illusion of expansiveness. Soften a modern, all-white room with wood flooring in a light shade, a simple wooden chair, and a rug made from organic material. Love this look? 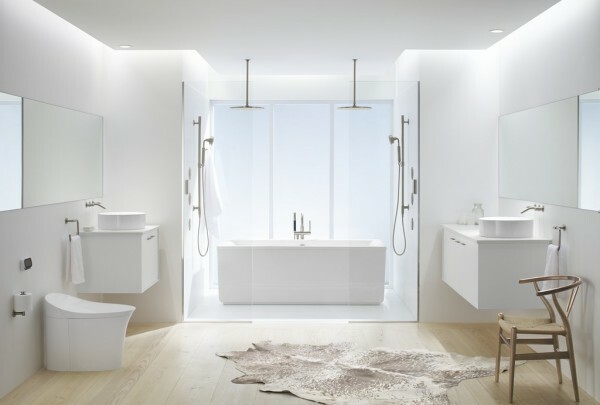 Explore our Pure White Bathroom moodboard.